Organize your daily printing tasks like never before with the Xerox VersaLink B605/SF B/W Multifunction Printer. 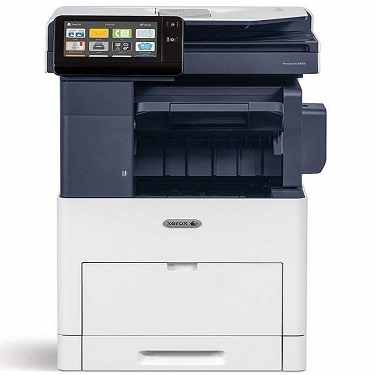 This B605 B/W Multifunction Printer from Xerox is a heavy-duty device that also helps you copy, scan, and fax your documents. The maximum mono print capacity of the Xerox VersaLink B605/SF stands at 58 pages/minute, enabling you to carry out your printing jobs quickly. It comes loaded with Gigabit Ethernet technology, a technology used for transmission of data at an incredible rate of a billion bits per second. Also, the Xerox VersaLink B605/SF B/W has a duty cycle of 250,000 pages with a recommended monthly volume of 20,000 pages. A striking feature of the B605 B/W Multifunction Printer is that it can handle a wide array of media types such as letterheads, bond paper, envelopes, etc. Media Size A4 - 8.30" x 11.70", Letter - 8.50" x 11", Legal - 8.50" x 14", 5.50" x 5.50", 3.50" x 5", 3" x 7.50"
Dimension (Height x Width x Depth) 33.3" x 18.5" x 19.8"